Several alternative joining methods had been tested in advance as well. Finally, bonding with light-curing adhesives could convince the customer with respect to process reliability and bonding technology and with manageable financial investment. 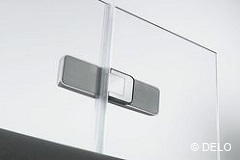 Therefore, one of DELO’s LED-light-cured adhesives is used to produce the latest generation of glass shower enclosures. The adhesive used gives high strength and has an excellent long-term resistance. At the same time, its transparency makes it suitable for bondings with high requirements on an attractive appearance as it is transparent after curing and remains so. While the hinge of conventional shower enclosures is screwed into the glass plate, the bonded door hinge provides practical and aesthetical features. For instance, the shower enclosure has flush inner surfaces without protruding superstructures or recesses in the glass plate. This results in easy cleaning of the inner glass surfaces. “We decided on bonding as a joining method in order to get a product with high-quality design”, says Guido Riegger, Development Manager at Duscholux. Duscholux uses DELO’s LED area modules to cure the light-curing adhesive. The decision in favor of LED technology was based on the possibility to control the intensity and the irradiation time in an automated process. As a consequence, the LED lamp can be switched off after irradiation, which is particularly user-friendly. The LED lamp’s wavelength and the adhesive used have been optimally harmonized. When applying a defined LED lamp intensity and wavelength, the adhesive gives its best performance and satisfies all of Duscholux’s high requirements on this bonded connection. Curing takes no longer than two minutes and the components can be loaded immediately afterwards. Even in terms of occupational health and safety, the use of LED lamps is uncritical as no radiation in the UVB and UVC range is generated. Furthermore, LED lamps do not form harmful ozone that would have to be exhausted. Protective measures are limited to a simple glare protection in case of direct sight contact. In addition, the heat input at the component is reduced to a minimum, which might be of importance when bonding temperature-sensitive substrates.